In response to officer killings of unarmed men around the country last summer, the Chicago Police Department equipped 30 police officers with body cameras late January, as part of a pilot program to provide evidence (or lack thereof) of police misconduct, such as unlawful search and seizures or excessive force, in arrests and interactions with the public. The cameras, which will be clipped to the officer’s uniform, headgear or glasses, will be piloted for 60 days before a decision is made whether to expand the program. One of the greatest areas of office misconduct is the violation of a suspect’s Fourth Amendment right against unlawful search and seizures. Whether it is an overreach of the Terry stop, which allows the police to approach anybody on the street they reasonably believe is about to commit a crime; an unlawful search of a suspect’s car at a routine traffic stop, or; failure to read a suspect his Miranda rights, police officer misconduct routinely occurs. Unchecked, it can cause mistrust of the police and the imprisonment of innocent defendants. Police brutality due to excessive force or even racial profiling is another area of misconduct that has been in the news quite a bit the past few months, with the deaths of Michael Brown and Eric Garner at the hands of police officers. 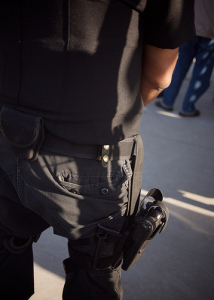 Police body cameras can help prevent excessive use of force and unlawful search and seizures by making the police accountable for their actions. For the majority of Chicago police officers, use of the body cameras will not change the way they do their duties because they are honest, upstanding members of the force. In these cases, the body cameras can only be a benefit to them, as it will prevent wrongful accusations of misconduct. But for those handful of officers who routinely violate the civil and criminal rights of Chicago citizens, body cameras should prove to be an extremely useful tool in cutting down on this behavior. For some officers, knowing that the body cameras provide a record of their actions will cause them to stop and think twice before using force where it’s not necessary or searching a victim without probable cause. For those who are not deterred by the presence of cameras, the images they capture will ensure that the innocent will not be sent to prison. And it will provide that all important evidence that could result in the indictment and conviction of officers who overreach their authority, ensuring that the real criminals are behind bars, and giving victims of police misconduct the evidence they need to file civil rights lawsuits. The criminal justice system has specific procedural safeguards in place to protect the wrongful conviction of innocent Chicago residents. As a criminal defendant you are afforded certain rights to prevent overreach of police and prosecutorial authority. The violation of those rights by Chicago police officers can result the charges against you be dropped, the case dismissed or a verdict of not guilty. Chicago criminal defense attorney David L. Freidberg has close to two decades’ worth of experience handling Chicago misdemeanor and felony cases, and aggressively defends his client’s Fourth Amendment rights. If you have been arrested or charged with any crime in the Chicagoland area, contact our Chicago, Skokie or DuPage County office 24/7 at 312-560-7100 and schedule your free initial consultation.